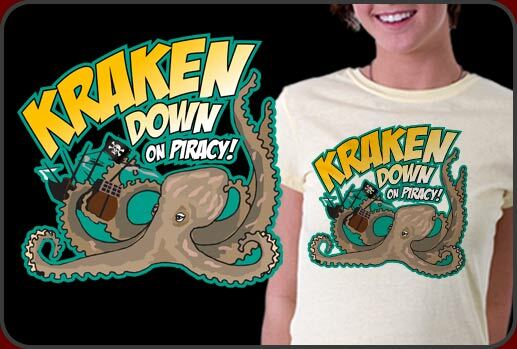 Our Kraken Shirt is a great way to thumb your nose at the establishment who won't rest until P2P file sharing is dead. The Kraken Shirt features a terrible monster of the deep grasping a jolly rogers pirate ship just before smashing it to smitherines. Poor pirates. They never knew that The Kraken was lurking nearby apparently. Our Kraken Shirt looks terrific. A lot like what you might see in comic books in it's design, actually. Dramatic colors and a rather funny premise makes this one a must own. We have our Kraken Shirt available on both dark and light shirts and we have alll sizes and styles for women, men and children too. Don't forget to check out our fun mugs, posters and buttons with this design too.